Are you spending a lot of time, money & energy on your marketing and networking efforts, but you aren’t finding your ideal clients? Trying to go broad with your target market might seem like a good idea. It seems reasonable that if you cast a wider net, you’ll have a great likelihood of “catching fish”. However, the opposite often happens. Maybe it’s time to take a step back and identify your target market. When you try to appeal to everyone, you don’t REALLY appeal to anyone specific enough for them to take action. By describing your target market in detail can you give them the useful content and recommend offers they need. You should create a target market profile that fits your list perfectly. Gather basic demographic information such as age, gender, location, income level, and education level. For example, if you are a real estate agent, do you specialize in a certain area, for people of a certain income level? This is probably the single most important bit of information you need to know about your target market. Identify areas where they have problems, pain, fear, worries, or questions. What are they missing but badly needing? This gives you tremendous insight as to what programs, products and services that address these deficits. Where does your target market hang out both online and off? This is important to know because that’s where you’ll go to find and connect with them. This makes it easy to find them online & in-person. What groups, organizations, and associations does your list belong to? This ties in to how they see themselves and their interests and hobbies. This also makes it easy to find them online & in-person. How your customers see themselves and the world around them is an important thing for you to know. Identify the types of things they think are interesting, amusing, annoying, frustrating, etc. This gives you info to talk about on social networks and in-person. Along with what they like and don’t like, identify what is important to your audience. Things they value might include family, hard work, saving money, safety and security, individual expression, standing out from the herd, etc. How does your product, service or program align with these values? What do your customers buy and how much money do they spend on it? This is an important thing to identify because it helps you understand what products to offer, how often, and at what prices. If you aren’t sure, check out your competitors! Identify what other lists your subscribers have joined. It’s also good to know what other companies they buy from. Where do they go when they need information on a particular topic? This can identify referral partners or events to attend where these companies will be. Identify the tone of your audience’s language. Do they use slang or idiomatic speech patterns, or are they more professional and formal in their language use? Do they stick to just the facts, or are they like to hear your personal stories? 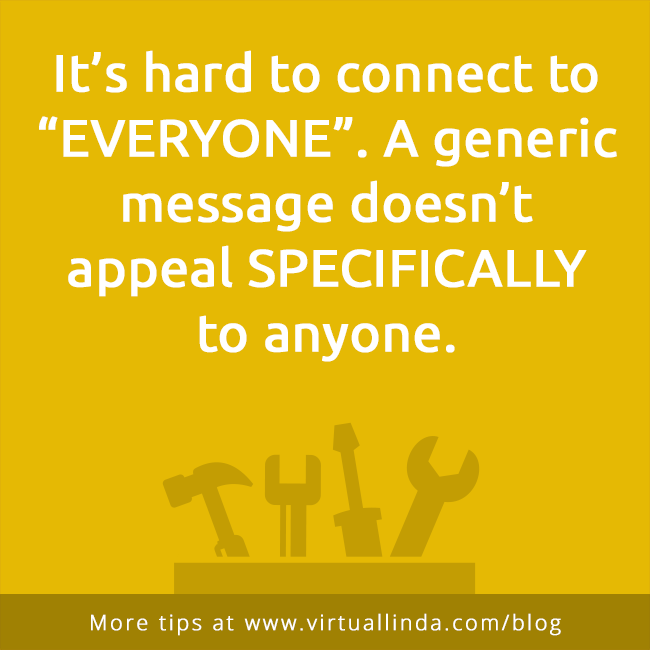 This helps you craft your marketing to speak directly to them. There are a number of ways to locate all this information. You can use use a survey or directly ask your clients or potential clients. Or you can use social media, online forums, and other sources to listen in on your potential list’s conversations. Research your competition and other companies in your niche. Look at key influencers in your niche or similar businesses in other markets and look at their followers. Research your target market and use the above information to create an Ideal Client Profile. Identify at least 2 different segments of your market and create a profile of an individual in each segment that’s a perfect fit to buy your fastest route to income.